Let’s not pretend here…we all have tight budgets, right? This is especially true in the church- the home of the $0 lighting design! Though the Bible is very clear that God is the only one who creates something out of nothing, sometimes it feels like we’re being asked to do the same in our church. The great news about lighting is this: by designing smart, you can create a really big looking design without spending a lot of dough. In fact, if you already have lighting, you may not have to spend anything at all – here’s what I mean. The first way to create a really big looking lighting design is to make your beams of light visible. There are 2 ways to do this: with haze, or with set design. Every lighting designer’s first wish is to use haze. When used carefully, haze can create a thin atmosphere that allows your lights to shine, but doesn’t necessarily look like a concert. Some churches are going for that concert look, while others want to stray away from it, and haze can really do either – it’s all about how thick you make it. Check out this post for my complete guide to using haze in your facility. Set design is another killer way to see the beam of light. Though you aren’t seeing the light travel through the air, seeing the light beam stream across a texture or flat set gives you significantly more impact then just having the light hit the people on stage. If you haven’t done anything with set design before, check out the “Tiny Lines” and “Big Blocks” set designs above. They’re both really easy for anyone who has some basic carpentry experience. Even better – if you have a full-time carpenter who goes to your church, they could bag the “Tiny Lines” design out really quickly! Another great way to maximize your lighting impact is to shine lights directly at the audience – with a twist! Nobody like it when you go to a concert and the lights flash in your eyes constantly, it’s just plain annoying when it’s overdone. However, if you hang your fixtures in view of the audience, you can run them at a VERY low percentage and get some really cool graphical looks. For example – take some cheap LED striplights and hang them vertically on trusses or pipes behind the band. Now, you’ve got what is basically a color-changing set piece at your disposal – and many of these striplights allow you to segment the fixture so you can run some cool chases to create movement throughout your service. Thanks to Timothy M. for this photo. In this case, he actually lit the sheet they’re using for projection – but you get the idea! One of the most underrated ways to make your lighting look bigger is to match your colors with the backgrounds that the video team is using. With just a little pre-planning and communication, you can have a unified look across your whole room – from the stage to the screens. It only takes a few minutes during rehearsal to go through the backgrounds that the video team is planning to use and match the shades of colors with the lights – it’s amazing how cool it can look! The last easy way to make your lighting rig look bigger, is to turn off some of your lights at times. Even if you only have 10 lights, you can still use 4 of them for those “big moments” in the service. When you are able to turn off some of your lighting most of the time, you can build energy along with the band. You can also have moments in your service where you go down to just 1 or 2 lights to light the worship leader, to create a moment of intimacy. Of course, you can really take this to the next level with a larger lighting rig. Think about ways that you can have moments of just backlight, just sidelight, or just frontlighting. Using the different angles of lights at different times can really make a huge impact on your show, because it helps keep everything visually fresh. Check out this post for the complete guide to using “dynamic range” in lighting. 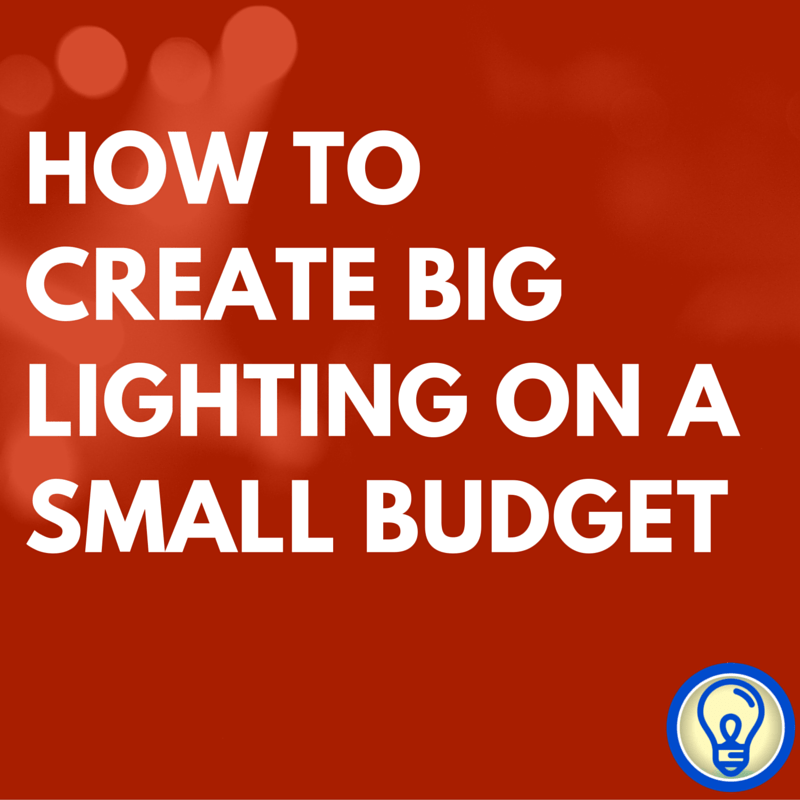 Creating great lighting and set designs doesn’t have to be expensive – and that’s a good thing! Starting with lighting? Grab my free guide to beginning with church lighting right here! Where do you find cheap led strip lights? Thanks!